I'm very new to this since at the office where I work my boss requested to show some world digital clocks since we work with customers from several countries. The problem is that they desync about 1 minute every 2 weeks, and that's very inconvenient, because we need to sync them one by one through a static configuration file generated by the software through the USB. I'm planning to buy new controllers for the clocks, but I need something that can sync through NTP with WiFi. I don't mind learning some programing, it's a lot of fun , but the important is the NTP and the WiFi. I saw another controller called XU2W which has wifi but I don't know if it will have NTP feature since this thing is very basic. I would be so happy if somebody could help me with a nice device, we don't want to spend a lot but I'm sure there are some nice devices not too expensive. P.S: Sorry, I forgot to tell that the LED Matrix we bought are 64x16 dots. Hard to offer anything useful without details of both the controller and the LED matrix. 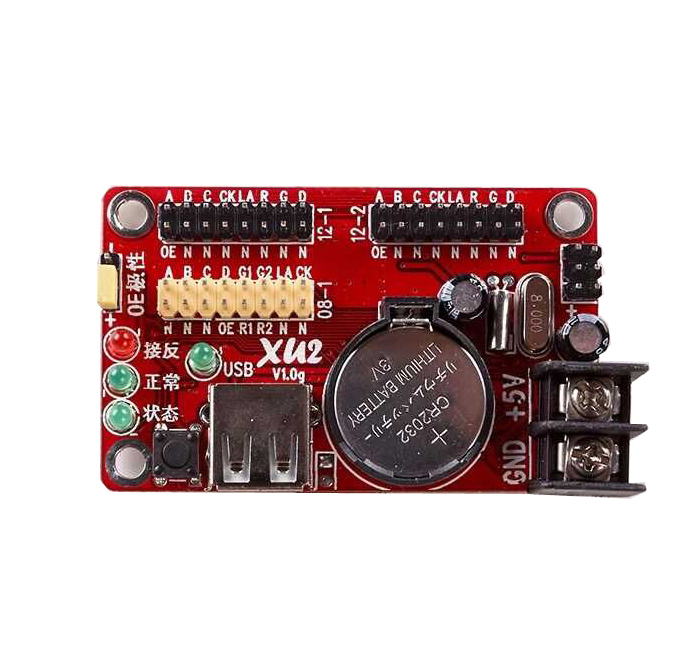 Most on this forum will be more familiar with the various Arduino boards and DMDs like this and you can find a lot of relevant information here with a little searching. Have you considered a GPS module (such as VK2828U7G5LF) - 100% accurate time always (as long as it has access to satellites) without the need for a network connection. But what you suggest seems amazing, if a solely GPS module can sync time like a NTP server it's the way to go. My home clock can sync time by radio frequence, or that is written on the box and it indeed syncs the time, but I don't know what technology exactly it uses. Would it be something like that? I'm only worried about setting the different GMT times for the clocks. If we can reuse these screens we have, could you recommend a cheap controller for this purpose? I suspect the controllers are dedicated units for this particular type of display and are probably not user programmable, but I cannot be sure as I am not familiar with these and cannot find any info on them. Is there some software supplied with which you can programme the controller (not just setting up the contents of the display)? If not, you are stuck with it as it is. The displays are 16 x 64 and are 1/16th scan according to your link and cannot be used with any of the DMD libraries mentioned on this forum without significant modification. And these libraries would require an Arduino in any case. Or you may be able to develop your own software to drive your display if you moved to a programmable device such as the Arduino. The simple answer would be Arduino Uno (or similar) with a suitable DMD (which are 16 x 32 LEDs on a 10mm grid so are much larger) and a GPS module. There are Arduino libraries for both the DMD (DMD or DMD2) and GPS (TinyGPSPlus) which makes programming very easy. A single Arduino could manage at least 4 DMDs - you probably only need 32 pixels wide (1 DMD) for a basic clock at full height, or you could run 2 lines at half height if extra displayed info is needed. Sorry I cannot help you with your original setup.